Mexico go into the tournament as one of the hardest to predict sides at the tournament. With only a handful of players remaining from the previous generation of regulars and a coach only appointed before the play-offs, it would be easy for the Central Americans to flounder in transition, yet the latest generation of mainly domestic-based players looked a strong side prior to their poor World Cup qualifying run, winning the Gold cup in 2011 and the Olympic Gold a year later while a weakened squad put in interesting if not successful performances at the last Copa America. Prior to the game, Cameroon were given favourites status by pundits over the “lightweight” Mexicans, yet not long after kick-off odds on the likes of bestbettingwebsites.com must have swung back the opposite way. One of few teams to consistently play with a back three, Miguel Herrera continued in this vein, lining up in a 3-5-2 with Giovani dos Santos hovering off of Oribe Peralta, while Volker Finke set up his side in a deep 4-5-1 formation. 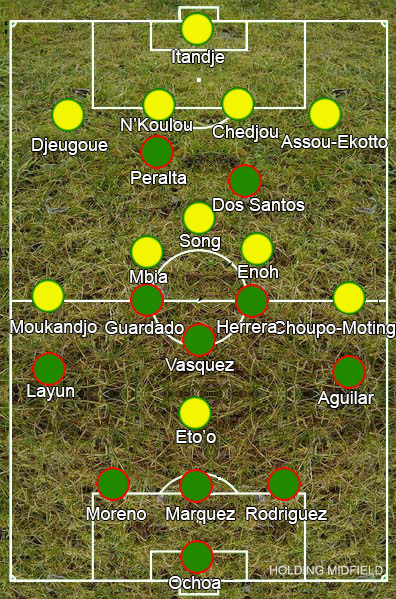 On paper, this formation should have given Cameroon the upper hand, but they had no idea how to deal with Miguel Layun and Paul Aguilar storming forward from wing-back despite outnumbering them in wide areas. Mexico established dominance early on in the game as balls were dropped behind the heads of the Cameroon full-backs time and again, while Samuel Eto’o cast a lonely figure up front as Benjamin Moukandjo and Eric Maxim Choupo-Moting were pinned back deep into their own half. The Mexicans being lightweight was worked around by not engaging the Cameroonians in physical battles. The ball was worked forward through quick interchanges of passes and clever movement, dashing forward but laying off the ball to a teammate before a defender could confront them – seen perfectly in their goal as Peralta’s link-up with Hector Herrera dragged the Cameroon defence out, freeing up the space for Dos Santos to get a shot away and Peralta to finish the rebound. Cameroon were struggling with the opposite problem to Croatia: while each of their central midfielders are decent in possession, none are primarily creative, which made the already difficult job of supporting Eto’o harder. Stephane Mbia stormed past Andres Guardado at one point and Alex Song would drop between the centre-backs to help move the ball out from the back, yet none of them were able to hit an early ball to their easily outnumbered captain. The addition of Pierre Webo helped them regain a footing in the game, but Cameroon’s late charge was as much to do with Mexico’s wing-backs no longer pinning them back now they had the lead as it was to do with Cameroon playing well. Like the opening game, it was looking like the officials were going to define the match, but Peralta’s goal meant Mexico got what they deserved. Whether they can do it against Brazil and Croatia remains the real test however. Nice analysis of the match. I was curious to see the first two matches have many refereeing controversies, but so far the subsequent games haven’t been as marred by the officiating. Motivation was clearly a factor in both teams, with Herrera having unified the team behind him and Cameroon having had a row over bonuses before flying over. Whether Mexico can keep up with Brazil and Croatia is debatable. If Croatia keeps a similar line-up to their match vs Brazil, they will give Mexico all kinds of problems. Brazil seemed a bit vulnerable at the back, so Mexico’s attacking intent could give them some issues, but I expect Brazil to win due to Neymar and Oscar. The key game is Mexico vs Croatia in the final group match.